Maa Durga is worshiped as Maa Mahagauri on eighth Navratri. 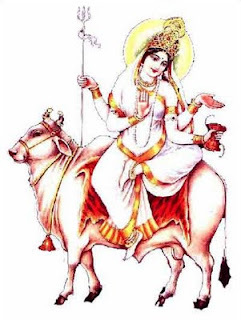 Mahagauri is the eight form of Goddess Shakti. Her color is white. Whiteners is shown by shell, moon etc. Mahagauri means one clean and bright like a ray of lightning. This is the form of Goddess Parvati when she did penance to get Lord Shiva as her husband. It is believed that due to the intense Tapas performed by her without moving caused soil and dust to collect on her body. Lord Shiva cleaned her with water from Ganga that’s why she get whiteners as shine & got the name as Maha Gauri.Purity is depicted in this form of Durga. The eighth day of Navratri Pooja has much importance. Durga Ashtami Puja is held in many parts of India. If human worship after fast he/she gets fruits immediately. In front of Portrait of Goddess Mother as in front of Parvati Mata in Lord Shiva temple one can worship Maa MahaGauri. She appeared in the form of Maa Ambaji, Maa Kalika, Maa Bahucharaji etc. She is like an eight-year-old girl. She is intelligent and peaceful, possesses three eyes and four arms, and uses the bull as her vehicle.The Eighth swarup of Ma Durga is Ma “Maha Gauri.” She is depicted as fair as a conch, moon and jasmine flowers. Her clothes and ornaments are white and clean. She has three eyes. She rides on bull She has four hands. The above left hand is in “Fearless – Mudra” and lower left hand hold a “Trishul.” The above right hand has tambourine and lower right hand is in blessing style. She is calm and peaceful. It is said that when the body of Gauri became dirty due to dust and earth while observing penance, Shiva makes it clean with the waters of Gangas. Then her body became bright like lightening. There fore, she is known as “Maha Gauri” .She is also worshipped as Ma-Ambaji, Ma-Kalika, Ma-Bahucharaji. Ma Mahagauri can be seen in a temple at Kankhal near pilgrim centre Haridwar, India The Ninth Swarup of Ma Durga is Mata Siddhidatri. There are eight Siddhis or accomplishments, they are- Anima, Mahima, Garima, Laghima, Prapti, Prakamya, Iishitva and Vashitva. Maha Shakti gives all these Siddhis. It is said in “Devipuran” that the Supreme God Shiv got all these Siddhies by worshipping Maha Shakti. With her gratitude the half body of Shiv has became of Goddess and there fore his name “Ardhanarishvar” has became famous. This swarup is depicted as seated on a lion and has four hands. She is the giver of all forms of accomplishments[Siddhis].As per the Brahmavaivart Purana there are 18 types of achievements which are Anima, Mahima, Garima, Ladhima, Prapti, Prakaamya, Ishitva,Vashitva, Sarvakaamaal, Saadhita, Sarvagynatva, DurShravana, Parkaayapraveshan, VakaSiddhi, Kalpavrushatva, Shrishti, Samharkaransaamarthya, Amaratva, Sarvanyayakatva, Bhavana and Siddhi. Seated upon a lotus, most commonly, with 4 arms, and is the possessor of different siddhis /accomplishments to grant her devotees. Mata Siddhiratri’s famous pilgrim centre, is located in Nanda Parvat in the Himalayas. Mahagauri the most fair, manifests as beutiful young girl with four arms radiating peace and compassion, she is often dressed in a white or green sari. Mahagauri holds a drum and a trident and rides a bull. Special benediciton: Protects long life of husband, promotes association of good people keeps you away from robbery, theft. Girls of marriageable age should meditate on her to get good husbands, while men meditate on her get a wife with beautiful qualities–energies of creation, sexual fulfillment. We see little dots of circular green and pink lights-activating knees, thighs giving freedom from fear, giving confidence and promoting the special benediction qualities. All golden droplets of light illuminate the wrist and anklets of all women on planet earth – these will bring balance and creativity at its highest form. Offering: Eight Custard apples-(shareefa, also known as sitaphal); accept as blessings in the evening and share with others; offer candle/lamp morning-evening. Mentally offer all fragrant flowers, fruits, gems, clothing. Definitely remember to offer coconut, Kumkum and Haldi (turmeric) to married women, money and food to young girls.